Samples of paint from the Royal Albert Bridge, which links Devon and Cornwall, are being analysed in an attempt to establish its original colour. The samples, collected by architectural paint researcher Patrick Baty, have been taken before the structure is stripped and repainted by Network Rail. There are about 30 coats of paint on the rail bridge across the River Tamar. Network Rail said the bridge was first repainted grey in 1911 and its original colour was never recorded. Mr Baty said the process of gathering the samples just involved a hammer and chisel and giving parts of the bridge "a healthy thwack". As part of the restoration project, the 2,200ft (670m) bridge - designed by Isambard Kingdom Brunel - will be blast-cleaned, strengthened and completely re-painted. Work is expected to begin on site by summer 2010 and will take about two years. Since the bridge opened 150 years ago in 1859, it has carried as estimated billion tonnes of rail traffic. It was Grade I listed in 1952. 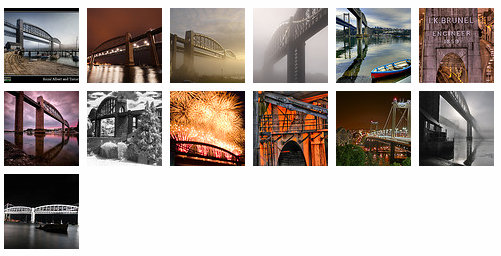 For a sample of great photos of the bridge please visit my Brunel Gallery on Flickr, which takes advantage of the latest feature on Flickr which allows me to highlight a collection of 18 photos from other people. There are currently 13 excellent and varied shots of this wonderful monument of engineering.